These projection use usefull for demonstrating the bones of the feet to show the condition of the longitudinal arches under the full weight of the body. Also may demonstrate injury to structural ligaments of the foot such as a lisfranc joint injury. Note: Bilateral projections of both feet often are taken for comparison. Some AP routines include separate projections of each foot taken with CR centered to individual foot. 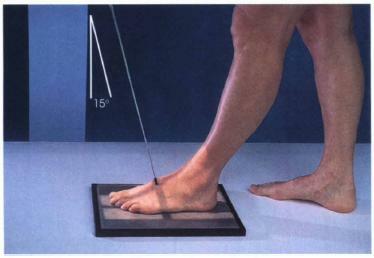 Take radiograph with patient standing erect, with full weight evenly distributed on both feet. Feet should be directed straight ahead, parallel to each other. Angle CR 15 degree posterioly to midpoint between feet at level of base of metatasals. Collimate to outer skin margins of the feet. For AP, projection shows bilateral feet from soft tissue sorrounding phalanges to distal portion of talus. For lateral, entire foot should be demonstrated, along with of 1 inch [2cm] of distal tibia-fibula. Distal fibula should be seen seperimposed over posterior half of the tibia, and plantar surfaces of heads of matatarsals should appear directly superimposed if no rotation is present. For AP, proper angulation is demonstrated by open tarsometatarsal joint spaces and visualization of the joint between the first and second cunieforms. 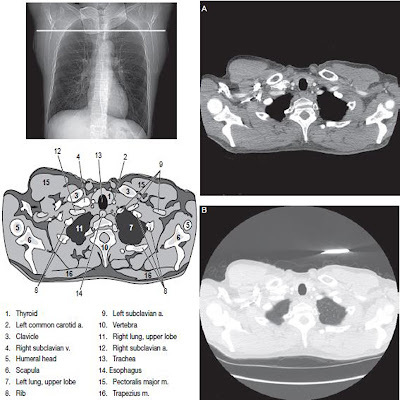 Metatasal bases should be at the center of the collimated field (CR) with the four-sided collimation including the soft tissue sorrounding the feet. 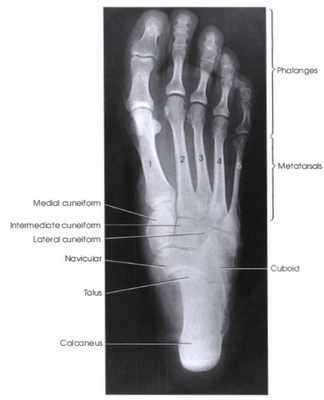 For lateral, center of collimated field (CR) should be to level of base of third metatarsal. Four-sided collimation should include all surrounding soft tissue from the phalanges to the calcaneus and from the dorsum to the plantar surface of the foot with approximately 1 inch [2cm] of the distal tibia-fibula demonstrated. Optimal density and contrast should visualize soft tissue and bony borders of superimposed tarsals and metatasals. Adequate penetration of midfoot region. Bony trabecular markings should be sharp.